Reader 少年Ａ submitted this sketch that he drew a few days ago. We thought the style was very unique. It's sort of what I would expect to see in a spin-off. The artist runs a blog that feature his sketches on a weekly basis. He recently started reading Initial D and love what he sees. So he decided to dedicate this week's drawing to Initial D. It's pretty neat. Do you like drawing? Show us your work and we might feature it on our page! 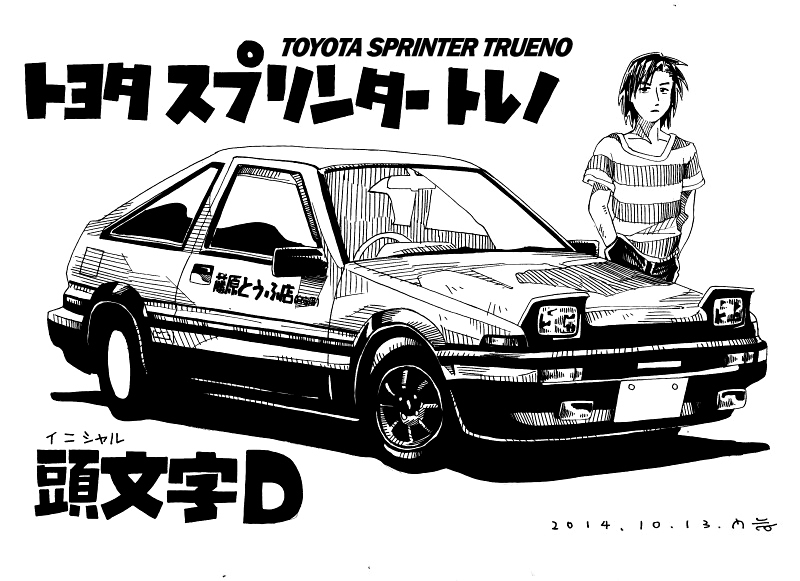 The Initial D hype has decreased considerably in the recent weeks. The new movie brought a lot of hype in the scene in a short time, but it went away just as quickly. The Blu-ray for the first part of the trilogy is slated for release on the day after Christmas (2014.12.26) We will cover that in the next post. Image size reduced, original size: 800 x 581. Click here to view the image in its original dimension.